Save the date! 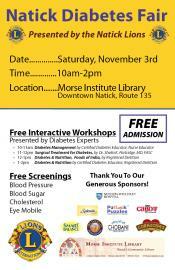 Saturday, November 3rd, we will be presenting our 5th Annual Natick Lions Diabetes Health Fair! Submitted by potluckpuzzles on Fri, 09/21/2012 - 02:37. WHAT CAN I EAT? INDIA is a 20 page Discussion Book™ designed specifically for the food and culture of India to help prevent and control diabetes. WHAT CAN I EAT? INDIA, thoughtfully helps people from India who are at risk or have prediabetes/diabetes look at how they currently eat and by the end of the book, what they can do differently to help prevent and control diabetes. Potluck Puzzle Discussion Books™ are designed to reinforce important nutrition topics for people striving to make healthy food choices.